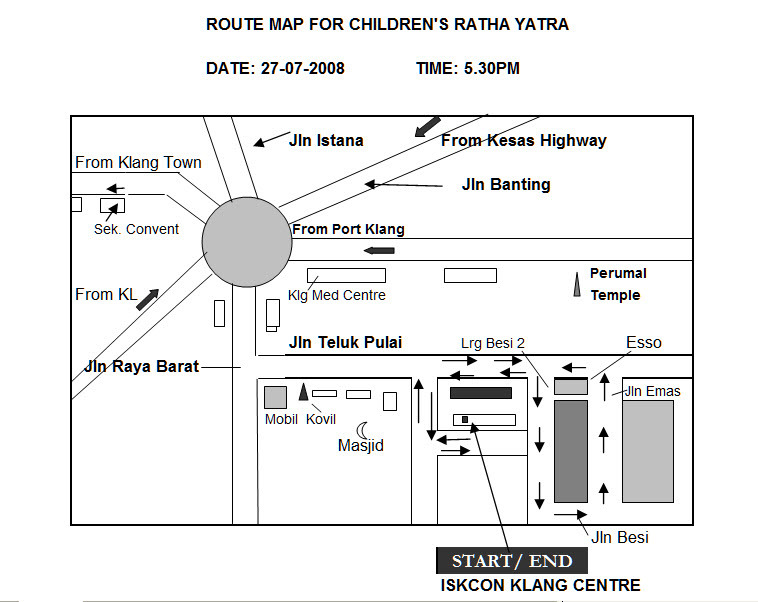 KLANG, MALAYSIA – It’s once again time for the annual Ratha Yatra in Klang. 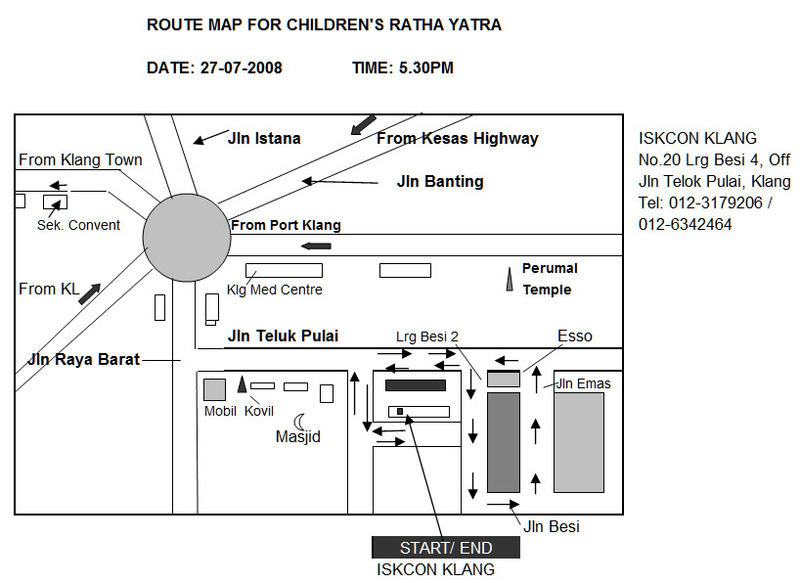 There are close to 20 Ratha Yatras in Malaysia yearly and among them, the Klang Ratha Yatra draws one of the largest crowd in Malaysia. The number of well-wishers in this town where “Little India” is found increases yearly and as a show of support they always present many gifts for the Lord of the Universe, Sri Jagannatha during this procession. In fact, the entire cost of the Ratha Yatra is sponsored by them. This year we are also blessed to get four sanyasis, HH Prabhavishnu Swami (Co-GBC for Iskcon Malaysia), HH Bhanu Swami, HH Bhakti Vrajendra Nandana Swami and HH Janananda Gosvami to accompany the chariot. Everyone is cordially invited to come and experience this wonderful journey as our chariot travels through the neighbouring area and “Little India”. A special program has been arranged by the Children of Gopal’s Fun School which includes a couple of dramas, sloka recitals, nursery rhymes, Vaishnava songs as well as a special dance show at 8pm at the center. Take this opportunity to also see the Guru Parampara deities which have been installed at our center. The chariot will be leaving the Iskcon Klang on Sunday, 21st December, 2008 at 5.00pm. Everyone is encouraged to make their offerings of fruits, flowers or incense on a try to their Lordships. For more info, please call HG Kalidas or HG Ram Gopinath at the Iskcon Klang Centre, at 012-6342464 / 012-3179206. The centre is located at 20 Lorong Besi 4, Off Jln Teluk Pulai, 41100 Klang. Each year the splendidly decorated chariots of Jagannatha, the Lord of the Universe, roll down the streets of Puri, Orissa state. Their towering red-and-blue silken canopies rise into the sky as drums and cymbals resound in joyous celebrations. People young and old, their eyes bright with excitement sing and dance in the street, as if swimming in an ocean of overwhelming happiness. The Ratha Yatra festival is perhaps the oldest continuously celebrated spiritual festival in the world. As far back as human records and memory extend, the chariots of Lord Jagannatha have rolled each summer in the town of Puri on the Bay of Bengal, to the delight of millions of joyous pilgrims. Throughout the year, the Deity of Jagannatha is worshiped in a great temple, the massive stone tower of which dominates the city of Puri. The Deity is not a mere statue. By His supreme potency, the Supreme Lord agrees to personally enter the form of Deity, just to accept the loving service of His devotees. In this sense the Deity is non-different from the Lord Himself. And once a year Lord Jagannatha comes forth in all His magnificent splendor to enjoy the Ratha Yatra parade and show Himself to all. Story of how this particular Deity came to be installed in the great temple of Puri is quite intriguing. Many thousands of years ago, a King name Indradyumna desired to have someone carve special Deity forms of Lord Krishna, His brother Balarama and sister Subhadra. Visvakarma, an architect and artist from the heavenly planets, agreed to make the Deities on the condition that no one would interrupt his work. The King agreed to this proposal, and Visvakarma set about carving the Deities, working in a locked room. Once, however, the King, impatient with the slow pace of the work, entered the room to see how much progress had been made. At that instant Visvakarma vanished, leaving three incompletely carved forms. Eventually the King, installed them in a great temple and worshiped them with great opulence. Each year he arranged a grand procession, during which each of the three Deities rode on a large beautifully decorated cart. Then 500 years ago, the festival became the center of the pastimes of Lord Caitanya, who is Krishna Himself appearing in the guise of a great devotee of the Lord. Each year Lord Caitanya danced and chanted in the Ratha Yatra festival along with His associates. To this day, the followers of Lord Caitanya eagerly participate in the chariot procession in Puri and others like it held throughout India and the world. The Vedic scriptures state that anyone who sees Lord Jagannatha or pulls His chariots achieves immense spiritual benefit. To avoid roadworks near the Klang bridge, those travelling from Kuala Lumpur are encouraged to use the KESAS highway.